A drunken student who scrambled 100ft up a pine tree and then fell asleep was rescued after calling the emergency services from his mobile phone. 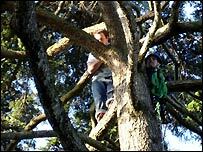 Eight firefighters went to The Park in Cheltenham at 0520 BST on Tuesday and found the man near the top of the tree. Climbing teams were sent up and he was brought down about two hours later. Station Officer Nigel Limbrick said: "He fell asleep and realised where he was when he woke up. But he had his mobile phone and was able to call us." The student, who has not been named, from the University of Gloucestershire, was treated at the scene by paramedics for cuts and scratches. He told paramedics he had spent most of the night up the tree. Mr Limbrick said: "He had had a skinful and in his inebriated state he climbed 100ft up a pine tree, without his shoes on. "He then fell asleep. I'm not quite sure how he managed it but he woke up wrapped around a branch. "He had quite a shock. He was lucky he had his mobile phone or he could've been up there for some time." Firefighters took around 90 minutes to rescue the student, bringing him down using ropes and pulleys.